I remember as a child being very impressed by a statement, attributed erroneously to Thomas Huxley, that claimed that if monkeys were left alone in front of typewriters, they would type by chance and, given enough time, would type the entire Encyclopaedia Britannica. I had an abridged version of the Encyclopaediain Spanish, fifteen thick volumes, so I had an idea of the extent of text involved. I read the statement for the first time in a creationism booklet, which pointed out the absurdity of the statement. But it made sense to me: unlikely, and yet, given infinite time, it could happen. While writing this book, I decided to investigate the matter a little and found out that this thought experiment about monkeys and typewriters has been seriously treated from philosophical and statistical perspectives and has been used in various popular accounts. In fact, this is one of the best-known thought experiments, dating to a 1913 essay by the French mathematician Émile Borel. Since then it has become a popular illustration of the mathematics of probability. Apparently the likelihood of monkeys typing the Encyclopaedia Britannica or Shakespeare's works is infinitesimally small. What is the relevance of this to a discussion about evolution and development? There are two points to discuss: the length of time and the probability of evolutionary change occurring during it. Geologic time is not infinite, but it is long, very long, or deep-a good descriptor considering that it is in the depth of rocks that we can learn much about this distant past. The term deep time originated with the American writer John MacPhee's popular account of geology titled Basin and Range. There he discussed how geologists develop a sense of the vastness of time intellectually and emotionally. Consideration also of the vastness of the extinct biodiversity raises a transcendent perspective, and it may be the most fundamental contribution to human understanding of the universe that geologists and paleontologists can provide. Thanks to dated fossils placed in evolutionary trees and to molecular estimates, we know that life originated at least 3.5 to 3.2 billion years ago and that multicellular life is at the very least 700 million years old. In the twentieth century one of the major achievements in geochemistry was the development of several methods of rock dating, based on isotopes of different chemical elements, leading to the secure establishment of an absolute time dimension of the vast history of earth and life. The evolution of biodiversity is said to have needed long periods of time. For Darwin, it was important to gather information about the antiquity of the earth and of life. He was concerned that there was "enough" time for truly complex structures, such as the eye, to have evolved. The later discovery of mutations and their "randomness" would at first glance seem to have made Darwin's worries justified. Evolution is far from random, and monkeys in front of typewriters are not a good analogy for evolutionary processes. One of the main points made in recent books on evolution is the non-randomness and predictability of evolution. This is not a theoretical conclusion but rather something shown empirically by the patterns seen in living phenotypes and genotypes and also in fossils. The fact that mutations in some genes have a high probability of being selected repeatedly in independent lineages facing similar environmental conditions is called "parallel genotypic adaptation." This makes genetic trajectories of adaptive evolution predictable to some extent, leading to the reconstruction of molecular processes that most likely operated in extinct species in spite of the contingency of evolution. Development in extinct species can also be reconstructed thanks to principles that have been discovered to be shared by huge groups of species, even involving the the same developmental genes. And yet diversity, in terms of both species and breadth of form, is vast, like the deep time in which it evolved. The theory of evolution provides a rational explanation for the rich biodiversity that surrounds us. Every day across the world more and more people live in cities, but even those who are rarely confronted with nature are aware of at least some of this diversity thanks to television or a visit to a zoo. Approximately 1.5 million species have been described, and 10 million to 100 million species are estimated to inhabit the planet. But this huge number of species is only a small fraction of the total number of species that have existed on the planet; conservative estimates suggest that as much as 99 percent of the entire diversity of life that has existed on earth is extinct. Most of that past diversity is largely undocumented in spite of the work of paleontologists, as remains of most of those species no longer exist or await discovery and study. The portion of this large diversity that is most directly obvious to us is vertebrates, the group of backboned animals to which we belong. There are about 59,000 living vertebrate species, but many more species have been described. Some vertebrate groups are better known paleontologically than others. Dinosaurs, for example, are known from some 550 described genera, but it is estimated that approximately 1,850 genera must have existed. Not all new genera and species of fossil organisms that are described are valid, as paleontologists continuously revise their decisions on taxonomy and new studies of variation and anatomy help to refine criteria on which to base decisions. A survey in 2003 determined that the then-valid 4,399 genera of fossil mammals represented 80 percent of the total number of genera ever described. This figure was 67 percent in 1945, as reported by the American paleontologist George Gaylord Simpson in a classic paper. More and more valid fossil genera of mammals and of other vertebrates are being named. The case of the evolution of our own genus, Homo, illustrates the controversy and diverging opinions on the taxonomy of fossil forms. Yet on many issues there is broad agreement. For example, most anthropologists acknowledge that about two million years ago, at least five different species of humans inhabited the planet. We are the last branch of a once much richer evolutionary tree since our ancestors diverged from chimpanzees some seven million years ago. The numbers I present here serve simply to illustrate the fact that if we wish to understand the evolution of biodiversity, looking at the past is fundamental. The role of paleontology in describing extinct biodiversity is obvious, but there are many other ways besides mere description in which paleontology contributes to evolutionary biology. The new fields of inquiry created by the emergence of molecular biology in recent decades brought about much well-founded enthusiasm. It also led in some circles to questioning the justification for continuing older disciplines such as paleontology. In the context of these discussions, many of my colleagues have reflected on the many specific aspects that paleontology alone can address to help other biological disciplines and establish an integrative research agenda. These include the following. 1) Fossils provide a time scale for evolution. The oldest representatives of groups from datable rocks provide numbers in which at least a splitting among groups of organisms must have occurred. If we have the DNA sequences of two living species and thus know how much they differ, and if we know when their forms became distinct in the fossil record, we can establish a rate of DNA change. This rate can then be used to estimate the divergence dates of other, related groups for which fossils are not yet known. 2) Fossils provide information on organisms' historical distribution in space. The young Charles Darwin himself noticed this during his voyage around the world. He recorded fossil marine molluscs in the Andes, with obvious implications for the dramatic changes occurring in geologic time. The discovery of fossil platypus relatives in South America several years ago, among other discoveries, provided hard evidence of presupposed faunal connections with Australia. The distribution across Southern Continents in the Triassic of a dog-sized early mammalian relative, Lystrosaurus, and of extinct marine reptiles called mesosaurs in the Permian provided independent evidence for continental drift. Fossils document the past presence on islands of many forms greatly affected by human presence and driven in many cases to extinction in prehistoric times, as is the case for the many giant lemurs found in caves in Madagascar. The list of examples is indeed very long, and the significance of fossils in solving (and creating) biogeographic puzzles or serving to test hypotheses based on living species alone is indisputable. 3) Fossils can document the order in which a suite of features that now diagnose a modern group of organisms or a species arose. Modern mammals uniquely have, in addition to many other traits, hair, mammary glands, and two tooth generations. However, we know that these traits did not all appear at once, as documented by a rich fossil record going back some 315 million years, the minimal time established by fossils for the splitting of the mammalian and reptilian lineages from their common ancestor. 4) Fossils documenting the origin of groups of living species are crucial for testing relationships among organisms. Without the extinct theropod dinosaurs illustrating the origin of birds, for example, it is more difficult to understand how a chicken can be more closely related to a turtle than to a mammal. Fossils improve the accuracy of evolutionary tree reconstruction through the recognition that features can evolve in parallel, such as the constant body temperature of birds and mammals. They can also provide direct information on what the first feathers and hairs of these animals looked like early in their evolution. Fossils often document organisms with a unique mosaic of features, which is very revealing for our understanding of the origin and function of living organisms' traits. Theropods show a unique combination of features that we would not know about just by looking at living species. Who would have guessed that creatures living in the Cretaceous, such as the terrestrial Tyrannosaurus rex, had colorful feathers? ò Does evolution proceed at a relatively constant rate, through the exponential accumulation of lineages, punctuated only by extinction events? Or does it proceed through bursts of speciations, including "adaptive radiations," otherwise remaining relatively constant? ò How can a very large number of characters of a phenotype change dramatically while not losing their structural and functional integration that any viable organism must possess? To illustrate the importance of fossils, I referred to the origin of feathers and hair. These are considered "evolutionary novelties": features that are very different and innovative and that somehow have led to, or are correlated with, a new chapter in evolutionary history. Another example is the evolution of hands and feet, as we have documented in the earliest representatives of the group to which land vertebrates belong. What biologists have agreed on and emphasized again and again is that to understand these innovations, you need to know how they developed in the individual history of the organism that possesses them. We recognize the human hand as a formed and flexible mixture of skeleton, muscle, skin, nerves, blood vessels, and other tissues. To address the origin of the hand you need to go back within a lifetime to our fetal period, during which its various components form. What are their connections with other parts of the body? Which genes are involved in their development? How do muscles, tendons, and bones come together? As stated by the evolutionary biologist Gⁿnter Wagner, "The explanation of evolutionary novelties is identical to the identification of the developmental changes that make the novel character possible." There is another trip back in time we need to take in order to understand the origin of the hand, and that is a trip in geologic rather than individual time. The first fossil vertebrates with muscular hands and feet lived nearly 400 million years ago. By studying those fossils, we can learn the ecological context in which hands evolved and the combination of anatomical features those animals possessed. We know that the earliest vertebrates with hands and feet had more than five digits on each and were aquatic. Now, imagine we could go back in geologic time and then go back in the individual developmental time of the now-extinct animals to understand how their hands arose. This hypothetical journey epitomizes the coming together of two disciplines that at first may seem quite distinct: paleontology and developmental biology. But their relation is exceedingly close. We can go back in time in the history of these disciplines and their relations and see how the parallels between individual and transformational change, as documented by fossils, have long been recognized. Whole disciplines or ideas arise or solidify in the canon of human knowledge thanks to the efforts and accomplishments of exceptional individuals with the interest, drive, and opportunity to pursue a particular subject. This was certainly the case with Georges Cuvier, often referred to as the father of paleontology. Cuvier was educated largely in Stuttgart and lived in Paris in the late 1700s/early 1800s. Over the course of several decades, he documented the anatomy of hundreds of fossils, establishing the reality of extinction and change over geologic time. He lived before Darwin and was never sympathetic to the evolutionary ideas of his former teacher Jean-Baptiste Lamarck, or those of Cuvier's peer, a person very much interested in development, Etienne Geoffroy Saint-Hilaire. Statues or busts of all these past glories of French science can be admired by any tourist in Paris visiting the wonderful Museum of Natural History and the Jardin des Plantes. Cuvier's anatomical work was widely recognized, and his prominent political status during and after Napoleon's reign also contributed to his visibility and to the spread of his encyclopedic work. Cuvier's magnus opus, Leτons d'anatomie, was translated into German by a famous anatomist working in Halle, Johann Friedrich Meckel the younger. Meckel's own work also concerned anatomical comparisons, but these were among embryos, and he was especially interested in malformations during development. What Cuvier did for fossils in Paris, Meckel did for embryos in Halle, as he amassed a huge collection of fetuses of many kinds of vertebrate animals. His legacy can be seen even in basic anatomical terminology: Meckel's cartilage, a major skeletal feature of the lower jaw in embryonic humans; and Meckel's diverticulum, a portion of the small intestine present in some people. Meckel saw his task as that of completing the work of Cuvier on anatomy by looking at embryology. With him, a long tradition of biologists studying embryos began. Meckel saw a parallel between the differences among adults of living and fossil organisms, on the one hand, and those among embryos of the same species at different time intervals during individual development, on the other. Figuring out the extent or truth or significance of this fascinating fact is what much of biology has been about for a couple of centuries. It is a pity that Cuvier and Meckel did not live to see a fossil that would have given them the chance to ponder extinction and malformations at the same time. A team of French and Chinese paleontologists working in northern China published in 2007 the discovery of a very singular specimen of a choristoderan reptile, representing a group of semiaquatic reptiles of uncertain affinities. Found in Cretaceous rocks known for yielding spectacular fossils of feathered dinosaurs and early mammals, the beautifully preserved skeleton has two heads, each connected to its own set of neck vertebrae, with the rest of the skeleton also completely preserved. The curled-up position of this and other similar but single-headed specimens suggests that this individual was a malformed embryo. Assignment of these fossils to the Choristodera was based mostly on the long neck vertebrae and the short limbs, two features characteristic of this group known from fairly complete and numerous adult specimens in this formation. The two heads/two necks malformation is common in living reptiles and is called axial bifurcation. This condition is not necessarily fatal, as many turtles and snakes have survived with it for many years in captivity. Obviously, choristoderes shared with living reptiles a developmental system in which this kind of developmental anomaly could occur. The opportunity to study developmental malformations in fossils is more commonly possible in the realm of invertebrates, where paleontologists collect and study hundreds if not thousands of specimens. Vertebrates are rarer and in most cases more time-consuming to prepare. The parallels between embryology and paleontology have been most commonly sought not through exceptional fossils but rather through comparisons of the two records or morphological transformation. This has been the case even for some scientists with an antievolutionary worldview, both before and after Darwin. For example, the Swiss-born naturalist Louis Agassiz, a student of Cuvier, looked for the relationships among "gradations" of taxa, developmental transformation, and geologic succession of fossils. By "gradation," he meant that there are differences among taxa in some degree or another, so one could mentally transform one into another by examining the nature of those differences. Agassiz realized that to understand these transformations, the examination of individual development and of fossils in geologic time provided illuminating parallels, even if he did not think that evolution was the mechanism ultimately responsible. An example can be read in his major work, Recherches sur les poissons fossils, published in several volumes between 1833 and 1843. Agassiz argued that the tail of adult fossil ray-finned fishes, to which almost all living fish species belong, except for the caelocanths and the lungfishes, paralleled the development of the tail of living species of the group from embryos to adults. Juveniles have a simple tail, later stages have a heterocercal tail in which the upper part is larger than the lower one, and the adult possesses both parts of the tail of similar size. This change is similar to the sequence that Agassiz recorded in fossils. That the differences but also the similarities among species were the result of common descent with modification via evolution was accepted by many other biologists after Darwin, most prominently by the German intellectual Ernst Haeckel, who was twenty-five years old when "On the Origin of Species" was first published in 1859. As discussed by his most recent and comprehensive biographer, more people in Europe read about evolution from Haeckel, including in England, than they did from Darwin himself or from any other author. Haeckel was the first person after 1859 to publish prominently an evolutionary tree with actual groups of organisms. Haeckel was also the person to popularize and ultimately to be held mostly responsible by later history to this day, for the notion that "ontogeny recapitulates phylogeny." This maxim encapsulates the idea that the individual development somehow mirrors differences among species. This notion has a history going back even to a major teacher of Cuvier, Carl Friedrich Kielmeyer, from Tⁿbingen, whose lectures at the university reportedly attracted crowds. The parallel between development and evolution has been a classic subject of investigation and discussion in German biology and is reflected in the German language: the same word, Entwicklung, can be used to describe both evolution and individual development. The hand of an early human fetus looks like a paddle, resembling superficially that of our aquatic ancestors. There are many other examples of general similarities between paleontological and developmental transformations. The most celebrated one is that concerning the evolution and development of our lower jaw and our middle ear, a feature we share with all other mammals. This case is often quoted as the ultimate achievement of comparative biology and therefore is worth examining in some detail. Mammals have a single bone forming the lower jaw called the dentary, a fitting name since this is where teeth are located. All other vertebrates have many bones in their jaws. Mammals have three ear ossicles, whereas other vertebrates with a similar kind of ear have only one. Although we may not think that our jaws and ears are connected, they actually are. Mammals are the anatomical oddball, and we can infer based on a Darwinian understanding of evolutionary biology that our early ancestors must have been similar to other vertebrates at some point in our history. In fact, fossils show that our common ancestor with reptiles, which lived at least some 315 million years ago, had several jawbones and a simple middle ear with a single ear ossicle. The first fossils illustrating the transformations that led to the anatomy of living mammals were found in South Africa and Russia in the 1840s, but since then fossils of the earliest mammalian precursors are known from all continents. Over the course of mammalian history, jawbones other than the dentary underwent a reduction in size, and an articulation between the dentary and the skull evolved. The old jaw articulation became smaller and smaller and gradually detached from the lower jaw. The articulation persisted but with a different function, namely, the transmission of sound waves, eventually becoming specialized for high-frequency sound conduction. The original articular-quadrate jawbones in mammals are termed the malleus and incus as elements of the ear, or more colloquially, the hammer and anvil. Together with the stapes, these bones form the three mammalian middle ear ossicles. The connections among the ossicles form a lever system, with which high-frequency sound waves are transmitted to the inner ear cells and ultimately to the brain for final processing. These mammalian ear ossicles, once part of the masticatory or skull apparatus in our extinct ancestors and in our living cousins including fish, are not much larger than small pebbles. In at least some mammals, it has been documented that during early development two jaw articulations exist: the original one of jawed vertebrates and still characteristic of reptiles and the new, mammalian one, between the dentary, our single lower jawbone, and the squamosal bone of the skull. The middle ear bones are attached via Meckel's cartilage to the inner side of the dentary bone. Some species from the late Triassic show exactly that arrangement: two simultaneous jaw articulations. The first fossil found to show this remarkable feature came from South Africa and was named Diarthrognathus in 1958 by A. W. "Fuzz" Crompton of Harvard University. Another "early mammal" well known among paleontologists is Morganucodon, from the late Triassic/early Jurassic, which possessed the typical mammalian dentary-squamosal jaw joint alone but had visible remnants of the "old jaw anatomy." Morganucodon was small, the size of a shrew, and although now known from Eurasia, Africa, and North America, it was originally described from localities in England and Wales. This remarkable example in the fossil record of the parallel between ontogeny and phylogeny does not mean that one can be used to fill gaps in the other. General similarities abound, but deviations are also common. When present, the similarities are sometimes striking but on closer examination become superficial. Marsupial young still in their mothers' pouches possess a dual jaw articulation at a stage in which the skull is not yet ossified and the arrangements of muscle and soft tissue are poorly differentiated. This is quite distinct from the anatomy of the adult Diarthrognathus (with two jaw articulations), which roamed some 200 million years ago in what is today the South African Karoo. That ontogeny does not simply recapitulate phylogeny is very well accepted, even though general parallels abound. To understand what recapitulation means as defined by Haeckel analytically, we can use a simple graph. For true recapitulation to happen, an addition at the end of the original or ancestral developmental sequence or trajectory would have to occur. In figure 6 we have four species, each characterized by a common developmental trajectory consisting of the first step, M1-M1. In each species, a new stage is added at the end of the sequence. In this ideal case, the species with the most specialized condition, species "D," contains in its ontogeny the sequence of evolutionary transformations that occurred through terminal additions. In evolution deviations from the hypothetical recapitulatory pattern occur, as Haeckel himself recognized. Changes mean that features in the sequence can move around, one or more of them can be deleted, or a whole new feature can appear. These changes are sometimes so dramatic or are considered so important that they are thought of as an evolutionary innovation, as in the origin of hair in mammals or feathers in dinosaurs. There are different kinds of deviations from recapitulation, and among them are heterochrony-changes in timing-and heterotopy-changes in spatial position in a structure. Some paleontologists have examined evolutionary transformations documented by fossils and compared them directly with ontogenetic transformations, quantifying the parallels or lack thereof. For example, the changes in the developing skull of alligator embryos are very similar to those seen in a series of fossils of early crocodiles. This similarity is not just superficial, but refers to a statistically significant correlation in the order in which discrete changes of the same features occur in both series. So, undoubtly, there are parallels between ontogeny and the fossil record of morphological change for some structures in some animals. But these are exceptions. Every window of development in the life of an organism is subject to change during evolution. This is to be expected, because organisms are exposed to environmental pressures in each stage of the here and now of their lives. A tadpole confronts challenges such as dealing with predators or finding food, and specializations may appear in this stage in the course of evolution. In fact, as far as frogs and other amphibians, such as salamanders, are concerned, a stunning diversity of embryonic morphologies and species-specific developmental features have been documented. Christian Mitgutsch, formerly in my lab in Zⁿrich, and his Ph.D. advisor Lennart Olsson, in Jena, Germany, the place where Haeckel had his long and celebrated academic career, have shown the great diversity in early frog embryos in terms of the timing of development of the cellular precursors of many cranial structures. They have done this by tracing the movement of cells from the neural crest, which is an embryonic layer in vertebrates responsible for the development of many vertebrate-specific tissues. These tissues include, for instance, portions of teeth and many bones of the skull. The work of Mitgutsch and Olsson has produced beautiful illustrations of embryos showing streams of cells migrating at different times and in different proportions in different species (figure 7). The earliest land vertebrates that populated earth offer an excellent paleontological example of changes in diverse stages of ontogeny.. Among these animals were some of the ancestors of living frogs, salamanders, and a group of legless amphibians. The most diverse among these first "amphibians" were the Temnospondyli, a group occurring from the Lower Carboniferous, approximately 340 million years ago, through the Lower Cretaceous, around 120 million years ago. They overlapped for much of their existence with terrestrial dinosaurs. The smallest were less than about 30 centimeters, but some forms were crocodile-like and reached some 7 meters in length. Juvenile and larval specimens have been described for many temnospondyls, showing much diversity in larval ecologies and growth patterns. All temnospondyls raised their young in the water, but the type of aquatic environment varied. Some groups preferred or tolerated brackish or even saltwater; others restricted themselves to lakes. These larvae were all carnivorous, as shown by their dentition and, in some cases, powerful jaws. The other fossil fauna registered in the sites where these exceptional fossils were found, as well as detailed considerations of the masticatory anatomy or the occasional stomach content of temnospondyls, reveal that some preyed on fish while others ate various small "amphibians." The remarkable preservation of diverse life stages in temnospondyls is explained in part by their large size, making them more likely to be preserved and also more easily visible to paleontologists working in the field. A related group, the lepospondyls, were, like the very earliest "amphibians," small: in the 5- to 20-centimeter range. There is almost nothing known about the ontogeny of lepospondyls, and this poses a challenge for paleontologists trying to precisely determine their relationships and the origin of the living amphibians using developmental data. Much variation in ontogenetic pathways has been demonstrated in a newtlike group of some of the earliest vertebrates with limbs or tetrapods, the branchiosaurids. Almost all twenty species of this group kept larval features such as external gills or gill denticles in mature stages; these are neotenic characters. Some other species went through a metamorphosis and lost their larval features as adults. All members of the group were small, in contrast to other temnospondyls. Thousands of specimens of some branchiosaurids are known from sites in Germany, including one in the Thuringian Forest Basin. There Ralf Werneburg has studied fossil temnospondyls such as branchiosaurids for many years. Some branchiosaurid species have features that place them as stream types; others, with visible external gills, are described as pond types. One discussion among experts is whether in some cases the two types can occur as different ecomorphotypes of the same species, bringing ontogenetic variation one step further by presenting a case of "phenotypic plasticity," a topic I discuss in chapter 2. As in the examples above, any stage during the development of an individual can change. This has been demonstrated empirically for many vertebrate species and their constituent stages. All stages of ontogeny and not just adults evolve, the subject of many research efforts. Many present data and ideas to criticize a straw man who defends the naive recapitulatory idea that ontogenetic and evolutionary transformations perfectly mirror each other. Most important, the desire to examine the fundamental aspect of how development has evolved has lead to the examination organisms of many groups, leading to several major discoveries. For example, Mike Richardson and, more recently, Ingmar Werneburg have documented the outer morphology of embryos that at a glance show, at more or less comparable windows of development, the substantial differences in proportions and shapes and size of the yolk in fish, snakes, frogs, birds, lizards, and mammals including humans. This feature is one of many that illustrate the different physiological and morphological features across individual time, across diverse species. If development tells a story, then it is like those ghost stories that children tell around a campfire, with each youngster adding a snippet, building on what has come before. There is no single narrator and no internal dialogue. There is what just happened, what is happening now, and what comes next. The changes in tissues that occur during individual development do so in the here and now of the living embryo. From that perspective, it appears as if adults are almost an accident, or rather just one of several snapshots of life. This does not mean that the features of a developmental stage are random; they are the results of processes we can in many cases quantify and predict-the product of well-coordinated and deterministic mechanisms wherein plasticity and chance play a major role in the outcome. There is a genetic developmental system that operates in an environmental context. This system lies behind the phenotypic unfolding of development, which is ruled by the physical and chemical laws that operate in nature. The explanation for the existence of a feature at any stage of development other than the adult is usually made in terms of a future state toward which animals aim. As argued by John Reiss in his book Not by Design, the explanation for the existence of a feature should be in terms of the needs at the moment of its existence, not in terms of a future state toward which it conduces. To understand this basic tenet, it is most useful to refer to the idea of the "conditions for existence" originated by Cuvier. The "conditions" to which Cuvier referred are the features of a living being without which it could not survive. An organism cannot exist unless it satisfies its conditions for existence. This may sound tautological or trivial, but like many great truths, the idea becomes fundamental only after it has been fully appreciated. This idea has important implications for the conceptual framework we use to examine the evolution of development. For example, when considering the ecological aspects of evolutionary diversification, a "niche" is often used as if it were to exist externally and as a target towards which a group of organisms aim. As has been argued before, a niche does not exist independently of organisms, which actually create it. Throughout life, an organism affects and also is affected by its environment. If a new oceanic island forms, eventually, by chance, some organisms will make it there. They will not do so with a plan or goal; they will simply try to survive. Most biologists are not so naive as to think organisms have a plan, but a narrative is often built around a designed plan. Natural selection constrains what evolves by "choosing" without a plan among the many experiments that development produced in a new environmental context. Because organisms are a mosaic of characters, all integrated but some significantly more than others, development will evolve in a complex way with the action of natural selection. Evolutionary changes in island species are sometimes explained as the result of a halt in or retardation of development, in which the island form simply resembles a juvenile stage of the ancestor. But organisms are mosaics. Each organ or part, although integrated with the rest, is governed by different rules of relative growth. An island species may have a general resemblance to a juvenile of the ancestral species, but this may be only superficial or valid for some features. The "mosaic" results over evolutionary time because of the conditions for existence that each stage of development has to fulfill. I have discussed several parallels between developmental biology and paleontology in subject and in approach. Another one is the teleological perspective, which holds that there is design behind the change, and design for the better. It is this perspective that has dominated in the two disciplines. The idea of a design and goal is associated with teleology, a term that comes from the Greek philosophers, who first discussed the issues of purpose and goal in life in different contexts. Unless one accepts the tenets of many religions or other forms of spiritual belief, teleology has no place in any scientific discussion on evolution. And yet the search for a narrative and ignorance of the self-organization principles of life led in the past to a teleological conception of life. A teleological view of life is not supported by study of fossil data. The fossil record shows numerous cases of diverse and parallel morphological patterns. Classic examples are the bushy evolutionary tree of horses going back to the beginning of the Eocene, some 55 million years ago, or that of humans, with the five species of hominids living simultaneously some two million years ago-only one of which survives today. Forms of teleological thinking that by current standards appear quite bizarre have been abundant in the history of biology. In many cases some sort of vitalistic force was claimed to exist that produced evolutionary change in a predetermined direction, triggered by an intrinsic property of organisms. Examples are the innate perfecting principle of Lamarck and the idea of "orthogenesis," the latter treated at book length by the influential biologist Theodor Eimer. These ideas of vitalism and inner driving forces of life greatly influenced paleontology. Evolution via "aristogenesis," a kind orthogenesis involving constant improvement, was advocated, for example, by Henry F. Osborn, a leading figure in American paleontology and for many years president of the American Museum of Natural History in New York, in the first decades of the twentieth century. To further understand the relation between ontogeny and phylogeny some pictorial representations are instructive. I reproduce my two favorites here. The first one is by the German botanist Walter Zimmermann (1892-1980), who, in addition to his work on plant morphology, was an original and influential writer on evolutionary theory and methods for biological classification. In the version of a "Zimmermann diagram" reproduced here (figure 9), there are spirals of ontogeny containing different life stages changing over geologic time. Phylogeny is the evolution of ontogenies, in this case illustrated by the origin of birds, with the emblematic Archaeopteryx, the "reptile-bird missing link" from Bavaria, in a reconstruction a few steps below the current bird ontogeny. The entire spectrum of change in time, including phylogeny and ontogeny, Zimmermann called hologeny, a term that was never accepted into the standard terminology of my field. Another scheme that nicely illustrates evolution was produced by Wolfgang Maier, my former mentor at the University of Tⁿbingen. Among his main contributions are investigations of the anatomy of mammals around the time of birth, when newborns face new environmental challenges. As Maier likes to point out, different species have evolved different anatomies around this window of development, and the same is true of all stages, from zygote to death-the entire life history. Natural selection operates at all stages, and the package of genes and structures and functions operating at diverse levels of biological organization change during evolution. In some cases this change is gradual, leading cumulatively over geologic time to large evolutionary transformation. Genetic changes are transmitted to the next generations via sexual reproduction. Many variables can be used to characterize the ontogenies represented in abstract terms in these figures. Among them are embryonic and juvenile stage durations, age at maturation, condition at hatching or birth, and reproductive longevity. All comprise the life history of an animal, and each can evolve. Analogous life histories in plants also evolve. In the case of living species, the ability to relate these variables to studies of population dynamics is important for conservation issues, as they can inform management strategies for those organisms considered at risk. From an evolutionary perspective, knowledge of these variables can help us understand why particular groups became extinct while others became prolific or just survived. Some of these variables are also related to major anatomical innovations, such as the large brain of humans enabled in part by a long gestation period. To know when these features arose, fossils are key, even though they cannot deliver direct information on some variables such as gestation length. This is the case because large amounts of empirical data have shown a close association of some anatomical features that become fossilized with life history features. As with the early land vertebrates discussed above, to document the evolution of life histories in the geologic past, exceptional fossils are the first and most obvious subjects to study. Since the pioneering work of Ernst Haeckel and with the theory of evolution as a framework, the reconstruction of the tree of life has been a major task. The history of approaches and issues is long and complex. An issue that has surfaced repeatedly in the discussions is how to incorporate ontogenetic information into the tree. The inference of relationships among species using morphology is usually done by comparing the existence and specification of diverse features. In the case of vertebrate specialists, we largely examine the bones, muscles, and nerves of adult animals. But heritable and interspecifically variable traits, the kind needed for tree-reconstruction analysis, are present at all stages in an animal's life cycle, so there is no reason only adults should be the source. Ontogeny is thus important, but how exactly should it be used? Most practicing systematists, those biologists concerned with tree reconstruction and classification, would agree with the following series of statements, which aims to summarize what is largely a consensus. 1) An approach based on the study of only adult stages is more likely to be misleading in phylogenetic analysis than one that incorporates a large segment of the life history of the species being studied. This is related to adding a level of complexity to the analysis of features of organisms (characters), going beyond the extreme atomization of superficial morphological similarity. An example of the relevance of juvenile stages for figuring out relationships among organisms is provided by animals that were studied by Charles Darwin himself. Barnacles were long thought be molluscs because of their calcareous shell as adults. But barnacle larvae are like those of crustaceans, and the two groups are now known to be closely related. 2) Ontogeny alone cannot be used as the criterion for establishing the direction of evolutionary change in a feature. Systematists seek to discover which features are ancestral and which are specialized, the polarity of change. If evolutionary transformations would always happen through additions of steps at the end of the original ontogenetic sequence or prolongation of an ontogenetic trajectory, the ideal case illustrated above, the comparison of ontogenies would reveal the direction of transformations. But recapitulations are the exception rather than the norm. Comparisons among groups closely related to the ones of interest serve to reconstruct the network of relationships. Once the root of the network is established, a tree of relationships through which to determine polarity is possible. 3) Not all groups of organisms are governed by similar growth processes, so the nature of the independence or of the morphometric relationships among parts is not universal. The differences I refer to are a major subject of study in the lab of my Zⁿrich colleague Hugo Bucher, who together with Claude Monet and others is developing new mathematical models for understanding the growth of ammonites, which are extinct molluscs. In molluscs, as for example in brachiopods or "lamp shells," the form of the shell is produced via accretionary growth at an aperture of expanding diameter, with a series of associated curves. In contrast, in trilobites and in other arthropods molting and the addition of segments occurs. In echinoderms, which include sea stars and sea urchins, the original bilateral symmetry has been modified into a pentaradial one, leading to modifications of the growth process. As I describe in chapter 9, clearly the generation of form in ammonites, trilobites, and echinoderms is different, which must be considered when reconstructing their evolutionary histories. The complex form of organisms is usually partitioned into features (atomization) when conducting numerical studies of phylogeny or evolutionary tree reconstruction. However, growth must be considered in these analyses, and it is a big challenge for systematists to figure out how best to integrate this line of evidence. 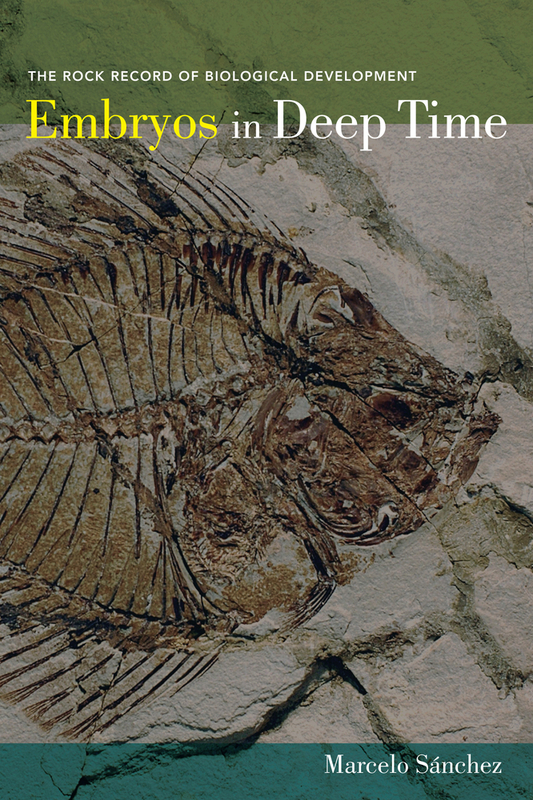 How can we bring together the study of genes, embryos and fossils? 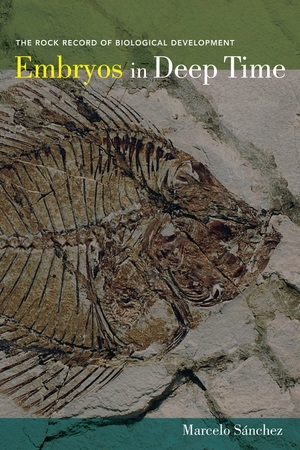 Embryos in Deep Time is a critical synthesis of the study of individual development in fossils. It brings together an up-to-date review of concepts from comparative anatomy, ecology and developmental genetics, and examples of different kinds of animals from diverse geological epochs and geographic areas. Can fossil embryos demonstrate evolutionary changes in reproductive modes? How have changes in ocean chemistry in the past affected the development of marine organisms? What can the microstructure of fossil bone and teeth reveal about maturation time, longevity and changes in growth phases? This book addresses these and other issues and documents with numerous examples and illustrations how fossils provide evidence not only of adult anatomy but also of the life history of individuals at different growth stages. The central topic of Biology today—the transformations occurring during the life of an organism and the mechanisms behind them—is addressed in an integrative manner for extinct animals. Dr. Marcelo Sanchez is an Assistant Professor for Paleontology at the Palaontologisches Institut und Museum der Universitat Zurich. Epilogue: Is There a Moral to Developmental Paleontology?